My mind began to wonder why ੴ is no longer the symbol of Sikhi. Many will say that it still is. But is it? 4) Service to the Creation. Suddenly one of the members in the audience asked me about the symbol on the face of the podium I was speaking from. It was Khanda Sahib. Yes, I was able to explain it as part of the Sikh philosophy to protect the honor of the weak and defend against the oppression by the strong. But inside me, I was not satisfied with that explanation and as overall representation of Sikhi. That got me thinking. 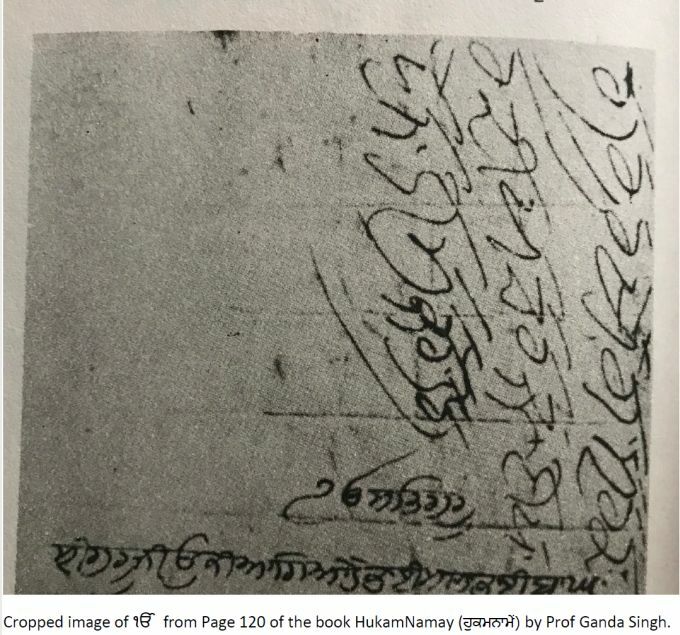 As part of my research, I learned that the hand written copies (ਬੀੜਾਂ) of Sri Guru Granth Sahib start with one and only one symbol in the first line of the first page and that is ੴ. So my mind began to wonder why ੴ is no longer the symbol of Sikhi. 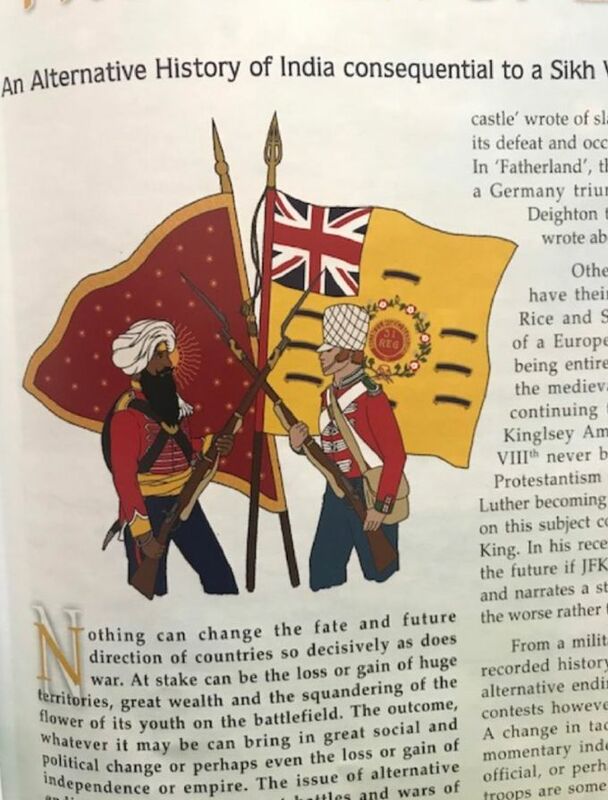 Many will say that it still is. But is it? Please direct your attention to the symbols displayed in and around Gurduara Sahibs. I find an abundance of Khanda Sahib and a very few of ੴ, specially outside the Gurduara buildings and wherever Sikhi symbol is included as part of the display at Interfaith organizations, Khanda Sahib is used to represent Sikh faith. So, I started to search for the introduction of Khanda Sahib as a symbol of Sikhi. That is, how and when was the introduced as a symbol of Sikhi? 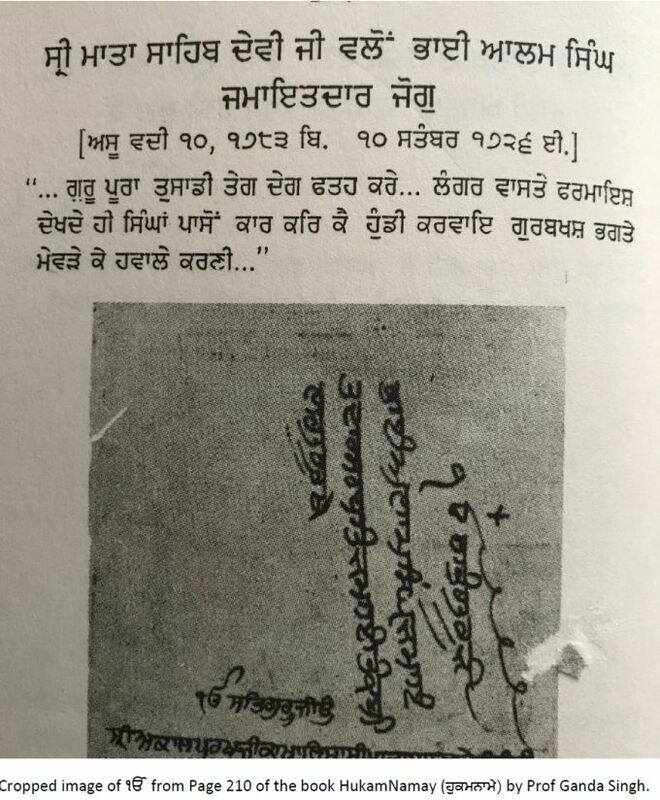 Asking around amongst the Sikh Scholars I knew, someone mentioned that the Khanda Sahib with two swords represent Miri and Piri (ਮੀਰੀ ਅਤੇ ਪੀਰੀ) and may be the Khanda Sahib as symbol of Sikhi, was introduced during the time of Guru Hargobind Sahib Ji and may be, it was used on his Nishan Sahib. I did not get too far with that thought as I could not find the old Nishan Sahib or even a painting of the Nishan Sahibs of that time. 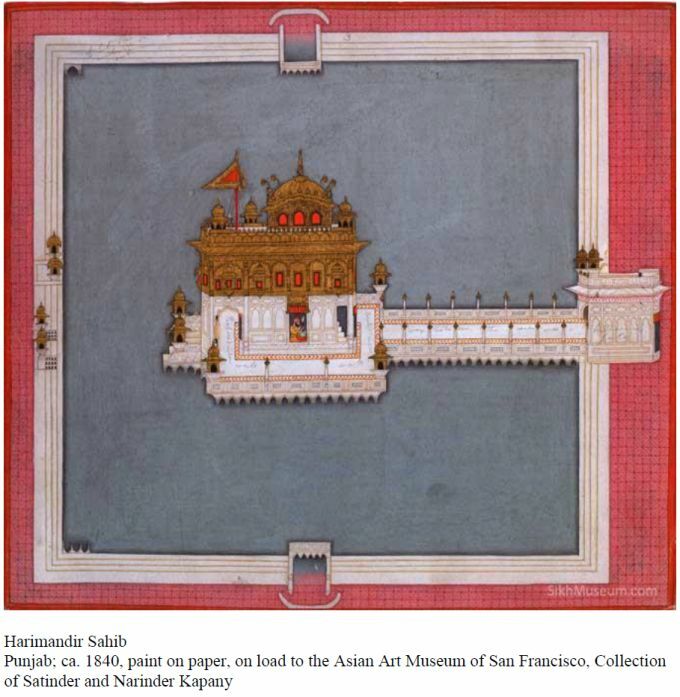 There is no symbol or the Nishan Sahib is included in the limited number of earlier paintings of Sri Guru Hargobind Sahib. 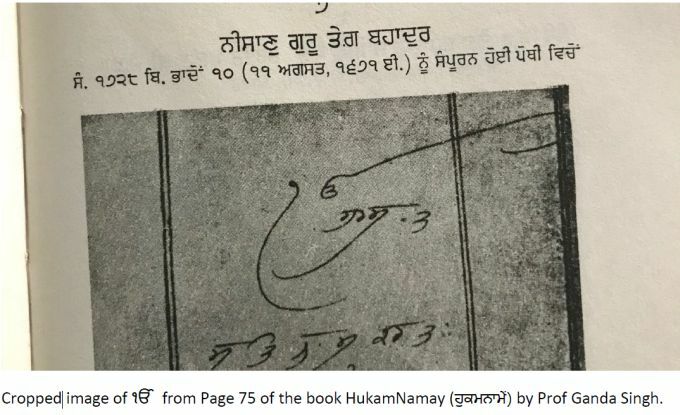 However, in the process, I was able look at the 1985 edition of the book ਹੁਕਿਨਾਸੇ (HukamNamay), by Prof. Ganda Singh. Thinking that, maybe the symbol Khanda Sahib would be used in the ਹੁਕਿਨਾਸੇ (HukamNamay) as the seal. But to no avail. Though I did make another observation while examining the pictures of the HukamNamay in this book. Every HukamNama started with ੴ and none contained Khanda Sahib. 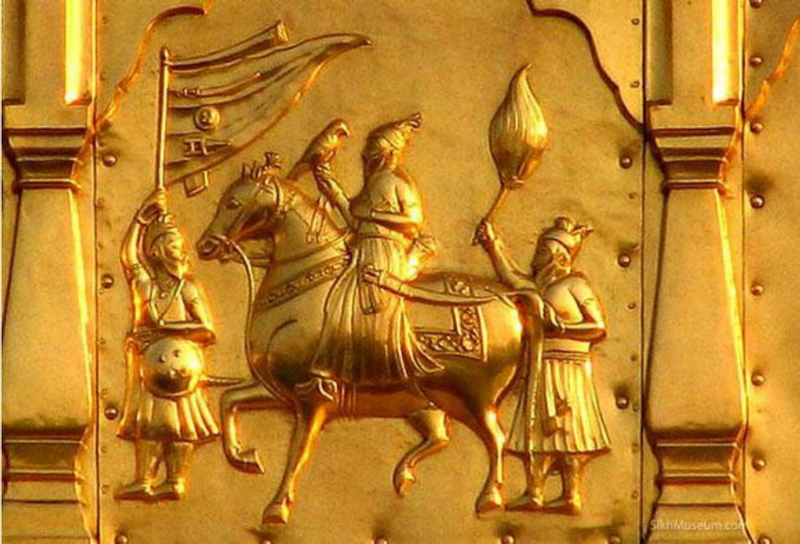 Even the ones from Banda Singh Bahadur, contained his seal, but do not have Khanda Sahib. Another interesting observation was that the shape of the ੴ is different in various HukamNamay. It varies as follows. For now let’s get back to the origin of Khanda Sahib as the logo for the Sikhi and we will come back to the shape of the ੴ later. 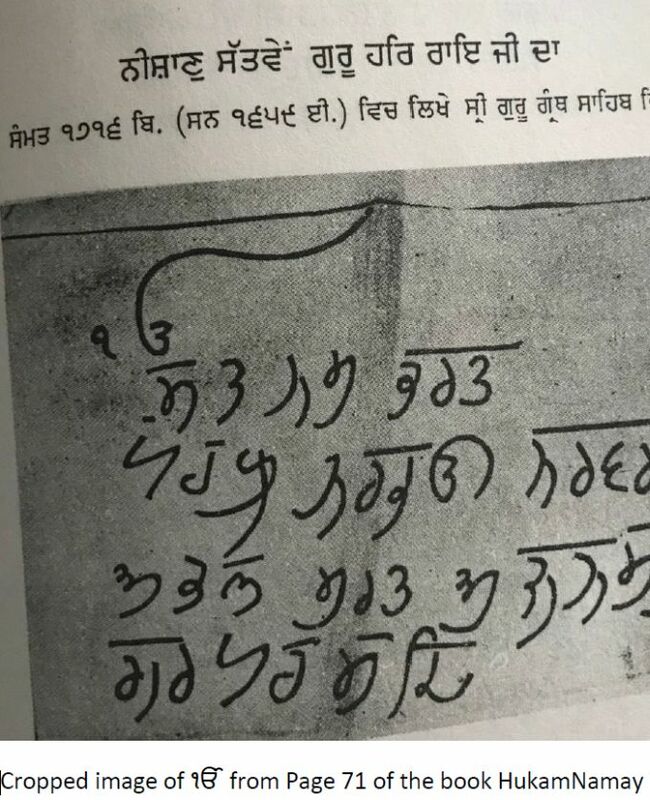 Not finding any sign of Khanda Sahib symbol in any of the HukalNamay, I turned to the thought that may be this was given to Khalsa Panth by Sri Guru Gobind Singh Ji at the time of Vaisakhi 1699, or sometime around then. 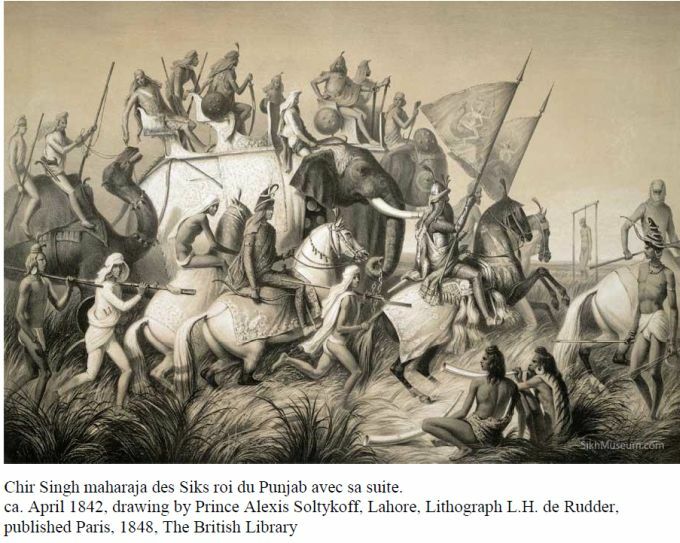 The search for Sri Gobind Singh Ji’s Nishan Sahib (Flag) was started, I came across many paintings of Sri Guru Gobind Singh Ji with a Nishan Sahib (Flag) as a part of the picture. Most of the time it was a triangular shape with different colors lining around the edges and some design in the middle. In some cases the central part of the triangular Nishan Sahib included the design of Kirpan, a Dhaal, and a Khanger. 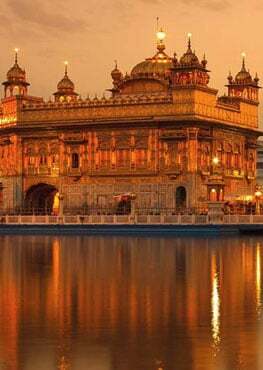 One such painting / picture is included above the front door of Darbar Sahib (also known as Goldern Temple), Amritsar, Punjab. It is included below. 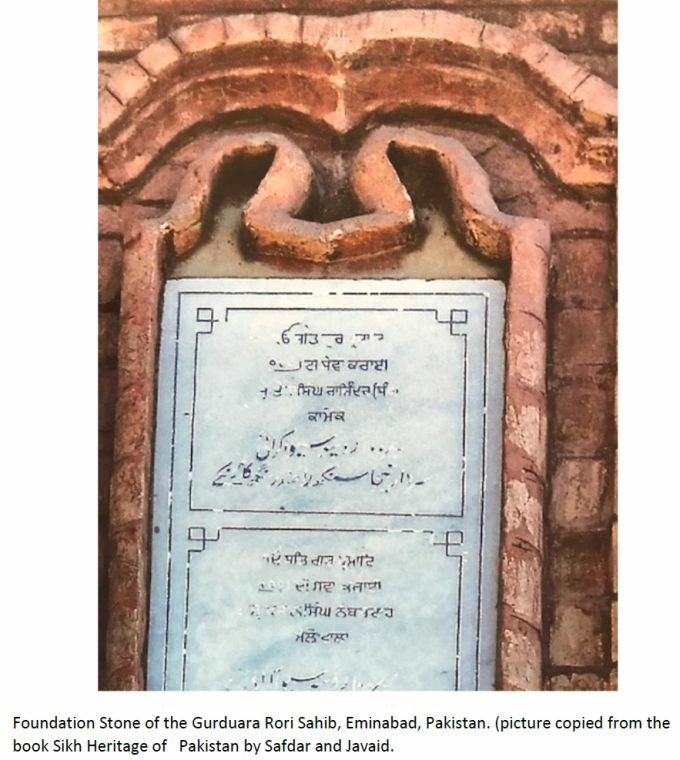 Since this carving must have been made around 1830 after the Tenth Guru Sahib and some time before Maharaja Ranjit Singh covered the Darbar Sahib Amritsar with gold, it is likely to be more authentic. I again notice that the Khanda Sahib is not included there. This started me on the way to looking for the symbols on the coins minted during the reign of Banda Singh Bahadur. Even though the names Nanak and Gobind Singh are present but I was unable to find ੴ or Khanda Sahib . 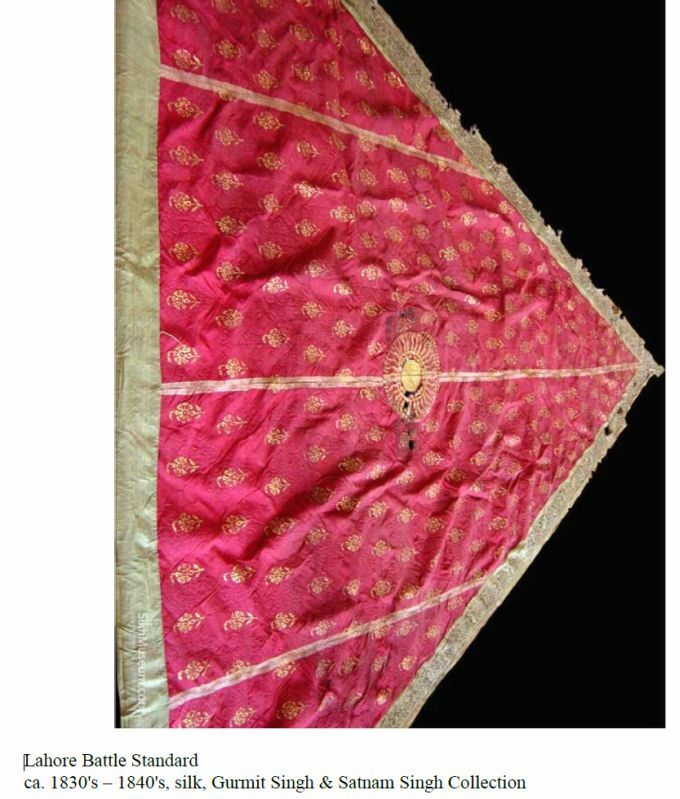 Continuing the search for the initial use of the Khanda Sahib in Sikhi, I started looking at the available pictures of the Nishan Sahib of Maharaja Ranjit Singh, the Khalsa Raj. Some of the pictures are included below. One of the captured Sikh battle standards formerly in the Dalhousie collection. The gold floral pattern on the silk background, three horizontal bands and sun motif are clearly visible. 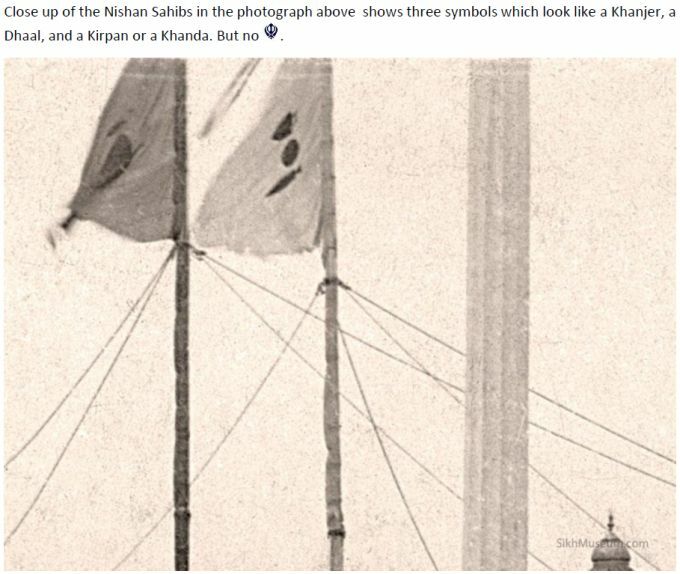 The pictures of Nishan Sahibs of Khalsa Raj included the sun but not Khanda Sahib. As part of my search I was able to find a 1840 CE painting of Darbar Sahib, Amritsar with a Nishan Sahib furling over it. 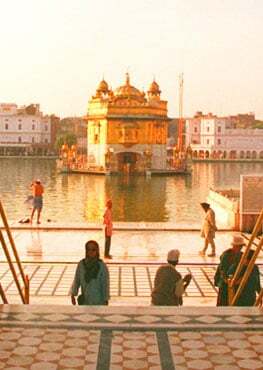 A large red color Nishan Sahib with gold lining is visible flying above the Darbar Sahib. No symbol ੴ or included in the Nishan Sahib. Additionally available is a 1904 photograph taken in ਪਰਕਰਿਾ (Parkarma) of the Darbar Sahib, Amritsar, shows two Nishan Sahibs furling over Akal Takht Sahib. It is included below. while the other is a light color, likely kesri orange. Close up of the Nishan Sahibs in the photograph above shows three symbols which look like a Khanjer, a Dhaal, and a Kirpan or a Khanda. But no . The symbols included in the Nishan Sahibs are neither ੴ nor Khanda Sahib. To me, all the above imply that the modern Khanda Sahib symbol is coined by someone after 1904, long after the Guru Period, and even after the Sikh Raj period. 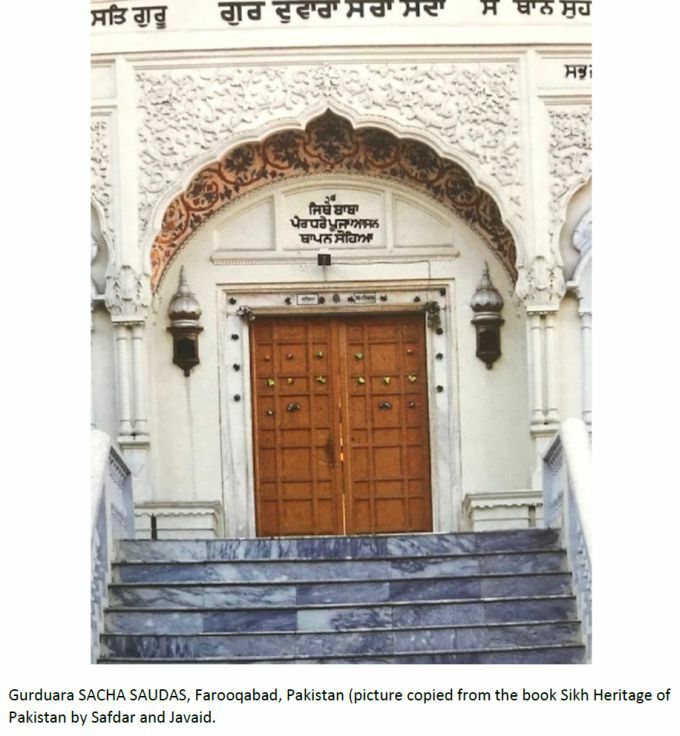 Additional supporting evidence comes from the pictures of old Gurduara Sahib buildings that were constructed in the eighteenth / nineteenth century or before and have not been remodeled show the ੴ symbol but not the Khanda Sahib symbol. Some pictures are reproduced here for your reference. In conclusion, it is believed that the ੴ , a representation of Sikh philosophy is given to the Sikhs by Guru Sahibs and symbol Khanda Sahib is coined by someone else with whatever objective they might have had in their mind. After looking at the above, it is then concluded that this Khanda Sahib symbol came into existence during the British rule and the reason for its introduction is, so far unclear. With this limited research it is my humble conclusion that the true symbol of Sikhi as given by the Guru Sahib is ੴ. This symbol (Logo) clearly represents the Sikhi Philosophy as given by Sri Guru Nanak Sahib and explained by the successor Guru Sahibs, and then enshrined in the Eternal Sikh Guru, Sri Guru Granth Sahib. In my humble opinion, the Nankian Philosophy of ੴ, includes the complete Sikhi Philosophy of MIRI and PIRI, therefore ੴ should be the main, if not the only, Sikhi Logo propagated to represent Sikhi in Gurduaras and to the outside world, including all the Interfaith groups. 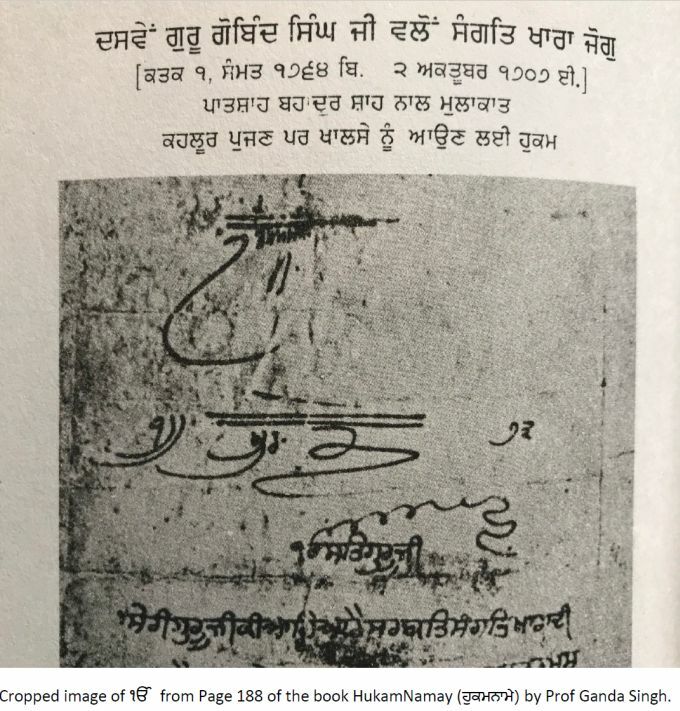 Since all the Nishan Sahibs, representing the local authority, have always contained SHASTER (Arms), maybe the Sikh Nishan Sahib should still contain Khanda Sahib or even the symbols used in the Nishan Sahib of Sri Guru Gobind Singh Ji. 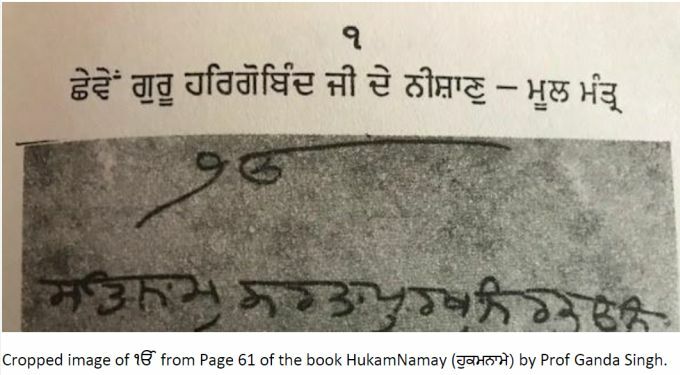 Observing that there are multiple shapes used by Guru Sahibs to represent ੴ in their HukamNamay, it is concluded that the ੧(digit one) and the ਓ (open OORHA) with some extension at the top are the foundation of all the shapes used by Guru Sahibs, a simple form given below, derived from the Hukamnama of Sri Har Rai Sahib, maybe used as representation. This will bring a bit of uniformity and simplicity to the symbol and avoid confusion caused by many shapes available on the Internet. You may notice some of them are so distorted that they are beginning to look like derivations from a symbol of some other faith. And the source of symbol Khanda Sahib for Sikhs still needs to be researched. Any help in this regard will be highly appreciated. 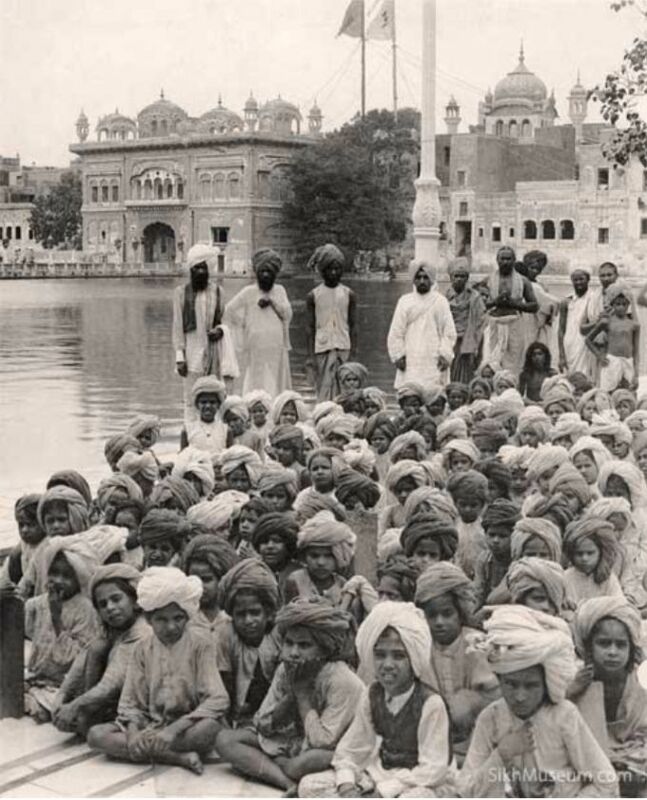 By the way, the Sikh community was very disturbed by the remarks alleged to have been made by Pandit Jawahar Lal Nehru right after the independence of India, that the Sikh are a “ZARAEEM PESHA” Community and a similar order alleged to have been issued by the then Governor of Punjab to the local authorities that Sikhs are a “ZARAEEM PESHA” community and the local authorities should deal with them accordingly. 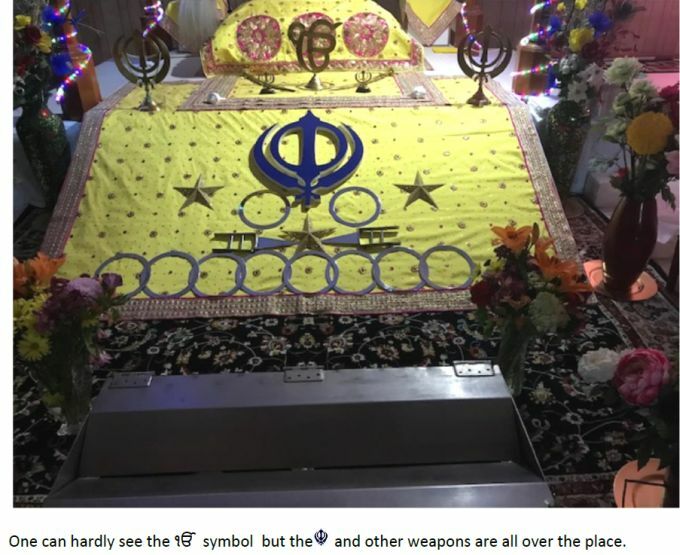 However, it is easy to understand such an implication from a non-Sikh, when they see Khanda Sahib as their religious symbol. Just think about it. In fact, at many a Gurduara Sahib including Bangla Sahib, the Khanda Sahib symbol is displayed hanging in the front middle of the Palki Sahib, right above the Guru Granth Sahib, the most prominent place, when this symbol is not given to Sikhs by the Guru Sahibs. In my humble opinion, there is no need to hang any symbols there, but if one feels compelled to have something hanging in the front portion of the Palki Sahib, it should be ੴ, the essence of Gurbani enshrined in the Sri Guru Granth Sahib. The same is the case with the logos normally displayed in front of the Sri Guru Granth Sahib in Gurduara Sahibs. An example is shared below. One can hardly see the ੴ symbol but the and other weapons are all over the place. In conclusion it is my humble opinion the Sikhi Logo as given by the Guru Sahibs is ੴ and the collection of arms, a Kirpan, a Dhaal, and a Khanjer used by Sri Guru Gobind Singh Ji or later the Khanda Sahib, are displayed on the Nishan Sahibs to indicate the local administrative authority. All those who agree with the above might wish to use / implement ੴ as the logo for the Sikhi (Sikh Philosophy) in their homes, letter heads, Gurduara Sahibs, and any other organization, or location.